The Zimmer Foundation for China has supported the cost of rebuilding four Medical Clinics with the donations from generous supporters. The medical clinics in the rural prefecture support many families who do not have the transportation nor the means to travel to the prefecture capital. Most of the clinics are older buildings of one or two rooms that were built over 70 years ago and no longer function as a safe and useable clinic. 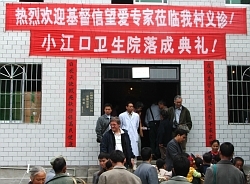 The medical clinics support many of the ethnic minorities in the rural Tongren prefecture. Well over 60% of the rural population (est. 4 million) are represented by over 28 Chinese People Groups (minorities). The cost to rebuild these clinics was between $4,500 and $10,000 each with the local government matching our funds to rebuild the clinics. Currently we are no longer working with the prefecture mayor and team to understand how we can provide additional information to help those needy people in the rural areas.